Now that we are officially in November, it’s time to roll out all of your best hearty soup recipes. As a traveler at heart, I am always looking to try new globally inspired recipes. I picked up my Senegalese Peanut Soup recipe in law school and have been enjoying it ever since. I’ve made this recipe with all fresh vegetables, all frozen and canned vegetables, and a combination of the two, and the soup is delicious every time, so feel free to use what you have available. This is one of those soups that is even more delicious in the days to come. Refrigerator time allows the flavors to intensify. Step 1: Boil 4-5 chicken thighs or chicken breasts. Shred chicken meat once cooked and sit to side. Step 3: Saute onion, garlic and fresh jalapenos/canned green chilies in 2 tablespoons oil in a large soup pot. Add in diced orange pepper once the onion becomes translucent. Saute ingredients for 10 minutes total. Step 5: Add 4 cups of chicken stock to pot and 1 can diced tomatoes (15 oz). Stir and let mixture return to boil. Step 6: Mix in 2/3 cup smooth peanut butter and 1 whole can of coconut milk. Stir until well incorporated. Step 7. 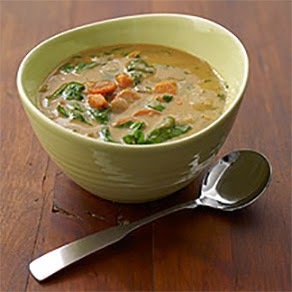 Add 4 ears of corn (off the cob) or 1 can of corn (15 oz) AND 8 oz of spinach (without stems) to the soup pot. Stir. Step 8: Last, add the shredded chicken to the soup. I have made this soup with both shredded chicken thighs and chicken breasts, and both ways will turn out well. Return to boil and then reduce heat. Step 9: Add salt and pepper to taste. I like to use garlic salt. Step 10: Garnish each bowl of soup with fresh cilantro. ENJOY! Please share in the comments if you try this great recipe!